Mmmmhmmm, that's right, fried chicken, fried pork chops, fried zucchini...you name it you can make it, with this delicious gluten-free coating mix from Hodgson Mill. I've never really used their products before, but I had an opportunity to chat with them at the Gluten Food Food Allergy Fest in Indianapolis a couple of weeks ago. They have TONS of gluten-free mixes, pastas, etc. - I was lucky enough to bring some home and try them! This mix brought back some wonderful memories of my Grandma. Growing up, my brother and I would go and visit our grandparents in southern Illinois during the summer break. I always have a memory of my grandma cooking in the kitchen. I especially remember watching her get her well manicured, hard working hands and nails, messy, covered in flour, as she prepared the squash or green tomatoes for frying. Well, I didn't have green tomatoes or squash on hand for frying, but I did have pork chops. It was only a few easy steps before we were happily enjoying our beautiful, golden brown, pan-fried pork chops for dinner. Following the directions on the back of the box, I simply moistened my pork chops with water, put them in the bowl of coating mix - tossed them, patted them, then into the pan of vegetable oil (use what ever cooking oil you like) they went! Cooked for 4-6 minutes on each side. NOTE: I would suggest not seasoning your meat or veggies with salt and/or pepper before hand - the mix has enough salt and seasonings. I like salt, and the seasoning was just right! AND....TA DA! A moist pork chop with a lovely crispy coating. A gravy of some sort would have been delish on the pork chop as well, but it didn't need it necessarily. I'm looking forward to making fried squash like my Grandma's and of course, some home-made fried chicken! 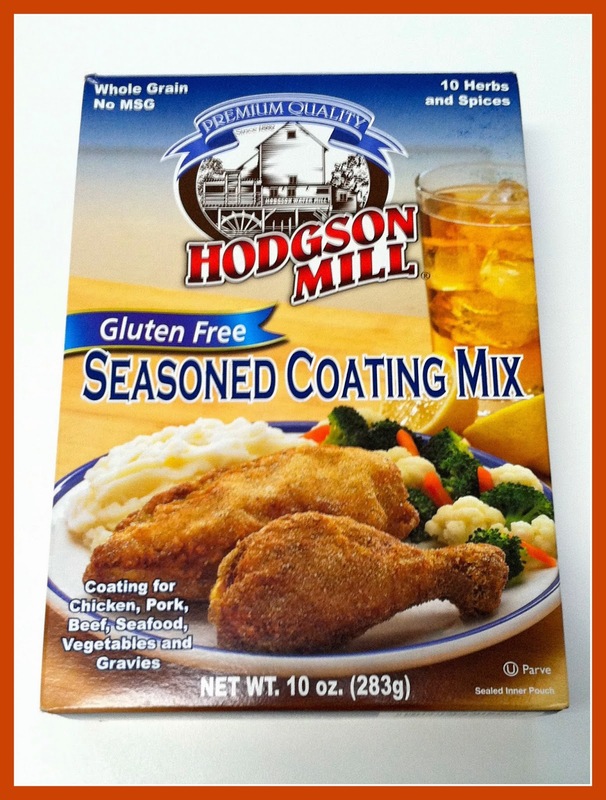 So 2 thumbs up for this gluten-free coating mix from Hodgson Mill.